Today we’re going to talk about palindromic dates, which I’ll define for you right now. If we write any date using the format MMDDYYYY, we get a string of eight digits (for example, today’s date would be written “04082011″). A palindromic date is any date for which the eight digit string looks the same whether written backward or forward. Today’s date is not a palindrome because “04082011″ is not the same as “11028040″. How about this one: January 2, 2010? Is that a palindrome? 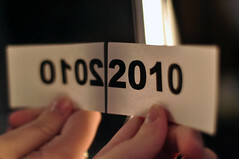 Let’s see…written forward that would be “01022010″ and written backward it would be “01022010″. Yup, that’s a palindrome. Got it? Ok, now you’re ready for today’s challenge: Tell me the most recent palindromic date before January 2, 2010. Extra credit if you can give me the two most recent palindromic dates before 01/02/2010. You know the drill – leave your answer in a comment below. Says Mom, “What do you do?” – You do what Mom says. Blessed are they that believe that they are blessed. Solution: Let’s work our way backward, in years, from 2010. 2009 doesn’t work because when written backwards it gives us an invalid month (90). Same story for 2008 through 2002 (month numbers 80, 70, …, 20). But 2001 gives us both a valid month (10) and day of month (02). That gives us the first answer: October 2, 2001 (10022001) is the most recent palindromic date before 01/02/2010. Continuing backwards, 2000 gives us an invalid month (00) so that year is out. All of the 1900s are out because they imply an invalid day of month (91). Ditto the 1800s, 1700, 1600s, 1500s and 1400s. Finally, we come to the 1300s, which implies a valid day of month (31). 1399 through 1391 again give invalid months but 1390 gives us a a valid month (09) and a valid day of month (31). Alas, although September 31, 1390 (09311390) is palindromic, September has only 30 days! Back to the drawing board…1389 through 1381 yield invalid month numbers but 1380 gives us a valid month (08) and a valid day of month (31). Let’s see – that would be August 31, 1380 (08311380). Yup, that’s a palindrome and a valid date. That’s our second answer. So the most recent palindromic date before January 2, 2010 occurred less than ten years ago. Amazingly, the next most recent palindromic date occurred over 600 years ago. Congrats to Ricardo Agudo, Katy Gustafson, Al Pessot, Lalo Hidalgo and John Holland for correct answers! Since the 1st 2 digits are the month, they must be between 01 and 12. Take 2010 and go back until the last 2 digits when flipped create a valid month. 2009 makes month 90 which is invalid. 2001 givens a month of 10. 10022001, Oct 2, 2001 is the most recent palindromic date. would be 1921, 2112, 12911921, but there is no 91st day of december. The first valid day is 31, which gives us a year in the 1300s. we end up with 12311321, Dec 31, 1321 as the 2nd most recent palindromic date.